The Executive Committee of the PYD has released this statement on the massacre in Kobane last week, the worst single atrocity committed by ISIS in Syria since the conflict began. Statement of the Executive Committee of the Democratic Union Party (PYD) to the Syrian and International Public Opinion: Kobane massacre, a moral test for all humanitarian organisations. The despicable and cowardly massacre in Kobane against unarmed civilians committed by ISIS, is a blatant crime against humanity and challenges the conscience of the world and all relevant human rights organizations. The world needs to stand on the side of the people’s protection units, YPG, and the women’s protection units, YPG, together with fighters from Burkan al Firat, who have bravely fought the barbaric ISIS gangs and their masters in Ankara. After building wall on the Rojava border in Nusaybin, the Turkish state is now fencing with barbed wire the Turkish-Iraqi border near Roboski village. Building walls and setting barbed wires show the opinion of the Turkish state towards the Kurds. The Kurds are regarded as potentially separatist. These practices show that there have been no changes in the attitude of the AKP towards the Kurds. Below we have collated a number of articles from the last two weeks, some of which we added also to our news briefings, which cover the West’s march towards war in Syria and analyse the latest struggles for Rojava’s survival within these latest developments. The European Lawyers for Democracy and Human Rights (ELDH), with members in 18 European countries, is absolutely opposed to the proposed use of illegal force by Western powers against the Syrian regime. The US government is leading a call for military action against Syria which will of necessity kill civilians, with the ostensible purpose of showing the Syrian government that by killing large numbers of civilians (allegedly with chemical weapons) they have crossed a “red line” and must be punished. Important information regarding the links between Turkey and Al Qaeda has surfaced after three Tunisian Al Qaeda militants were arrested by Afrin public security forces in Rojava. The militants, who passed through Istanbul Ataturk Airport-Antakya-Cilvegozu border gate into Syria officially, were accompanied by Turkish military officers. Turkish authorities have not acknowledged any links with Al Qaeda despite the many documents and information to the contrary. The passports used by the three Tunisian Al Qaeda militants arrested by Afrin public security forces is further proof of this relationship. They show that the three Tunisians passed through Istanbul Ataturk Airport to Antakya and then crossed the border into Syria from Cilvegozu border gate officially. 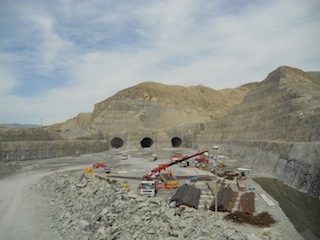 A new construction phase was celebrated at the Ilisu dam site with a big ceremony last week: The Tigris river has been diverted at the construction site now flowing through three big tunnels. This diversion will be maintained for several years. Now the construction of the actual dam in the dry river bed begins. The Turkish Minister of the Environment Veysel Eroglu called the Ilisu dam an “important strategic and economic project”. He stated that the project will be finished in summer 2014. After that it will take one more year to flood the reservoir. Gustave Tuck Lecture Theatre University College London, Gower Street, WC1E 6BT* How to find us.